Based around Intel's X-series Extreme Multi-core CPUs, this pre-built bundle is ideal for customers looking for the absolute best performance possible for a desktop PC. 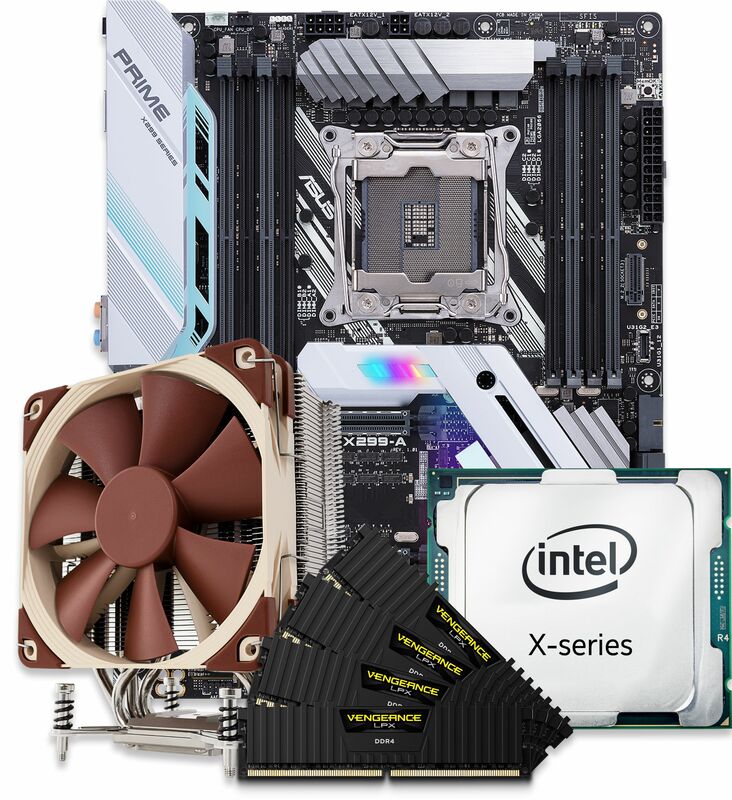 This particular bundle includes a Intel X-series Extreme CPU, ASUS motherboard, RAM from Corsair and your choice of either a fanned CPU cooler from Noctua. As with all our bundles, our experts will assemble it and run specialised software to ensure it all works as expected prior to shipping. Intel are the without a doubt the most popular processor manufacturer in the world and their Skylake X Refresh series CPUs offer incredible performance for enthusiasts and PC professionals. Available CPUs include the 8-core Core i7 9800X, all the way to the impressive 18-core Core i9 9980XE! ASUS have been the UK's number one motherboard manufacturer for years. When you look at the quality of their motherboards it is easy to see why. This particular bundle is supplied with the ASUS X299-A motherboard and features everything you would expect from a high-end motherboard. Noctua have catapulted themselves to be a contender as one of the best CPU cooler manufacturers with their high-quality and very quiet coolers. Their DX i4 series of coolers have been specially designed for the X299 (LGA2066) platform and therefore will work flawlessly. ASUS PRIME X299-A LGA2066 ATX Motherboard ? 3.5GHz Intel Core i9 9900X 10C/20T 165W 19.25MB Skylake-X Refresh CPU ? 3.3GHz Intel Core i9 9940X 14C/28T 165W 19.25MB Skylake-X Refresh CPU ? 3.1GHz Intel Core i9 9960X 16C/32T 165W 24.0MB Skylake-X Refresh CPU ? 3.0GHz Intel Core i9 9980XE 18C/36T 165W 24.75MB Skylake-X Refresh CPU ? 128GB Corsair DDR4 Vengeance LPX 128GB (8x16GB) Memory Kit ? Noctua NH-U9DX i4 High Performance Intel Xeon CPU Cooler ? Noctua NH-U12DX i4 High Performance Intel Xeon CPU Cooler ?